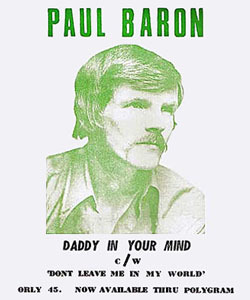 Paul Baron was an alter ego of Paul Muggleston's in the late sixties, when he attempted to create a new identity by recording a country and western ballad type song called "Daddy In Your Mind" based on his strong emotions about the untimely loss of his dad. This track was recorded under the name of Paul Baron and was released on the Christchurch-based Orly label in 1969. Unfortunately, despite correct promotional material, the record label was incorrectly set as "Daddy On Your Mind" and was pressed as such. The flipside was "Don't Leave Me In My World". Paul's Idea was a Christchurch pop group which had as a line-up - Paul Muggleston (Rhythm), Dave Chapman (Lead), Kevin Frewer (Organ), Pete Ward (Drums). The group recorded one single on the Robbins label "Cia Amore" / "Ape Call" in 1969. The line-up for that recording was - Paul Muggleston (Rhythm), Dave Chapman (Lead), Neville Claughton (Bass), Peter Goldsmith (Organ), Pete Ward (Drums). The recording was put down onto one of Robbin's old Rola 2-tracks by "engineer" John Phair (also ironically Keith Robbin's son-in-law) on the desk. According to Neville Claughton, the sound effects included "a trash can with empty grog bottles in it". Paul returned to New Zealand in 1969 and then headed off to Australia, playing around that country for 2 years before returning to join Radio Avon and play with "Just Us" in Christchurch, until 1979, when he headed to Sydney and did the Club Circuit as a solo act, working in a couple of TV Soap Operas. 1986 saw Paul in Los Angeles, USA where he spent 20 years in the commercial recording business, before moving out to Las Vegas, and spending several years entertaining and singing in local Clubs. Paul is now living in the state of Washington, about 90 miles north of Seattle.